Mahindra Two Wheelers have received a fair bit of success in the motorcycle market with its commuter offering – Centuro. But like every other major two-wheeler manufacturer in our country (barring Bajaj Auto), Mahindra also knows that to increase its sales figures it has to focus on the booming scooter segment. 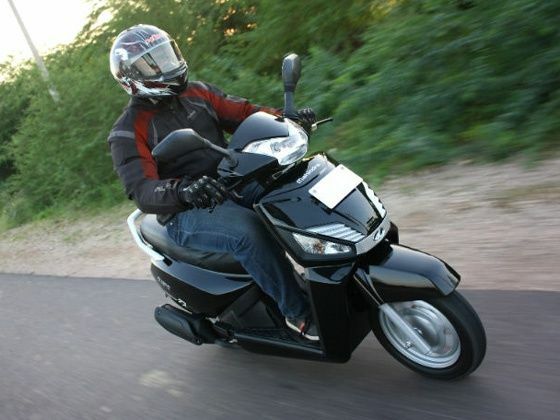 The Indian automotive giant is already present in the Indian scoter market with its 125cc offerings but it is the 110cc segment that has the lions share with respect to sales. For this purpose Mahindra set out on indigenously developing its first global scooter codenamed G101. After over two years of development and testing, Mahindra has finally launched the new scooter christened the Gusto. We spend a morning with the new Mahindra Gusto in Jodhpur to find out whether it has all it takes to make a mark for itself in the highly competitive 110cc scooter space. At a glance, the Mahindra Gusto doesn’t look radically different from any of the other scooters in our market. But on closer inspection, the design details start to appear. The Mahindra Gusto has handlebar mounted sharp and angular headlamp with LED pilot lamps (segment first), which can be best appreciated in profile. While the boxy and beefy front mudguard looks out of place on the Gusto. The slightly raked front apron holds the Mahindra logo at the centre above which the faux air vents are positioned flanked by turn indicators on either side. The Mahindra Gusto employs an analogue instrument console which houses a speedometer, odometer, fuel gauge and various tell-tale lights. The instrument cluster is neatly laid out and is easy to read while in motion. Switch gear quality along with fit and finish on the Mahindra Gusto is satisfactory while the finish on the plastic did look a bit coarse. The Mahindra Gusto features the longest seat in the segment with chunky grab rails at the rear below which sit a striking looking LED tail light. The overall design of the Mahindra Gusto isn’t revolutionary but it should appeal to the masses that prefer subtle and easy on the eye styling. Being a Mahindra offering, the Gusto has been loaded with features most of which are first in our scooter market. The most talked about feature on the Mahindra Gusto will be its seat adjustability. The seat height can be altered manually depending on the height of the rider in two different settings. Mahindra says that the two different height settings has been finalised after taking feedback from numerous female and male riders. Another clever feature on the Gusto is the self-locking mechanism on the seat that maintains the seat in an upright position without the rider having to hold it manually. This feature will be of great use when the rider fills fuel or while accessing the underseat storage. Below the instrument console is a spring loaded storage where rider can store various knickknacks like a mobile phone, wallet etc. The kick lever on the Mahindra Gusto has been positioned to the front so that the rider doesn’t have to get down from the scooter to kick-start it. Also the Mahindra Gusto gets a flip key similar to the one found on the Centuro. Powering the Mahindra Gusto is an in-house developed 110cc, single-cylinder motor which Mahindra calls M-TEC. The single-cylinder engine churns out 8PS of peak power and 8.5Nm of maximum torque. Power is transmitted to the rear-wheel via a CVT transmission. Acceleration of the Mahindra Gusto is a bit lazy in comparison to its other 110cc rivals. But it makes up for it with a punchy midrange as I was able to hold speeds up to 80kmph without much effort that too with a pillion on board. The M-TEC motor is amiably refined and one doesn’t encounter vibrations until the Gusto has hit its performance apex when minor vibes start to creep in from the footboard. Riding position on the Mahindra Gusto is upright and comfortable with ample amount of space on the footboard. I lowered the seat to check whether it changes the dynamics and was surprised to notice how much of a difference a few millimetres (35mm to be precise) in seat height can make. The Mahindra Gusto employs 12-inch wheels, the large diameter wheels apart from adding stability also have contributed in the Gusto having the highest ground clearance in the segment at 165mm. We didn’t encounter any sharp corners to test the handling capabilities of the Gusto but whatever few turns we encountered it handled them neutrally. The Gusto tips the scale at 120kg which is significantly higher than its rivals and if Mahindra can reduce the weight by a further 10kg I am sure it will make the handling even more confidence inspiring. Ride quality of the Mahindra Gusto is decent with the front telescopic forks doing a great job of absorbing the bumps but I personally found the rear setup to be a little stiff. Also the foam density of the seat has been revised and it isn’t too soft which was the case with older scooters from Mahindra. For anchorage, the Mahindra Gusto employs 130mm dia drum brakes at front and rear which provide adequate bite but a little bit more feedback from them would have been appreciated. Mahindra claims that the Gusto will run 63km to a litre of petrol, which makes it among the most fuel efficient scooters in our market. We will have to verify this claim after we do a proper road test but I personally feel in real world conditions it would return between 50-55kmpl. The Mahindra Gusto with its indigenous list of features, refined motor and fuel efficiency does make a curious case for itself. But it would be an uphill task for the Gusto to make a mark in the fiercely competitive 110cc segment given the fact that it has entered into the fray so late. Having said that, it does tick all the correct boxes from consumer’s perspective and Mahindra needs to be appreciated for the work they have done on the new scooter. Whether the buyers will accept it is a question only time will answer. The Mahindra Gusto will be offered in two variants - the base Dx variant has been priced at Rs 43,000 and loses out on features like height adjustable seat and remote flip key. The Mahindra Gusto Vx has been priced at Rs 47,000 (both the prices are ex-showroom Delhi and introductory).